I've been thinking a lot about how we want to set up the nursery this time around. I've seen so many gorgeous rooms for the little ones that I think one day I will even write a separate post about what I love. But often, when I click on certain pieces (like furniture or decor) in those pictures, I realize that they are way out of my price point. In fact, the last time I shopped for nursery furniture was more than 5 years ago. Back then we scored a pretty nice set of a crib, a changing table and a dresser on clearance for only $199 for all. Well, when I say nice, I exaggerate a bit. The crib is pretty solid even though it's huge. The dresser and the changing table are made of glorified MDF pieces. Over time, they both been covered with nicks and chips. The top of the dresser was completely destroyed when our humidifier broke. And the actual dresser is small. The changing table on the other hand is big but broken. Not that I was going to buy new anyway... But when I turned to classifieds, it gave me more sticker shock of it's own. 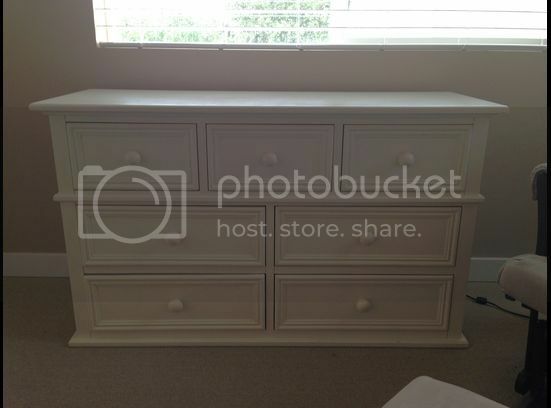 For example this nice dresser was listed for $350. It's gorgeous but $350?? So how much money would you spend on a nice, solid dresser that should last your family many years of love? That white dresser is very nice! But quite quite pricey unless it is solid wood. I bought my oldest the IKEA "Malm" 6 drawer and a bedside table 10 years ago and they both look new today. I did buy glass to put on the top to make them easier to wipe and protect from spills. I hope the weather is being kinder to you and the 2 babes! I bought a few pieces from IKEA that I just love and some that ended up being a piece of crap. That's why I'm always hesitant with their store and prices. And thank you! :) The weather is still nasty but since we fixed our swamp cooler, I can finally breath here. Dressers are expensive! I know some people use Craig's List. Do you have something like that there? Great deals can be found if you're diligent to search daily, and quick to jump on new offers. It's too stressful for me, but my oldest and his wife got a great couch and matching loveseat for $50 that way. That's where I got the picture from :) I found some awesome deals on classifieds over the years, that's why I had a total sticker shock to see that their prices are not much different from the major retailers. We actually have one Habitat for Humanity store, and I was just thinking about it yesterday! It's a bit of a drive but we definitely want to check it out. And good luck to you on finding a new bed set!! Frankly, your babies will probably be premature and smaller than an average baby, so you can get away with putting both of them in your big crib for awhile before you have to buy 2 new cribs. A friend had twins back when we were both preggo age and that's what she did and it worked fine until the babies got more mobile. I wouldn't spend a lot on cribs or dressers, unless they are convertible into youth beds and dressers and you'll be having them around for years to come. Oh, we are looking at the convertible cribs, for sure. I used our changing table all the time but there is definitely no need for it. That's why we want to just get a dresser and use a pad on top of it. But as for cribs, I'm kind of set on it. I'm a part of the group "Got twins" on babycenter and, unfortunately, I've read too many stories when babies who are seemingly too young, would suffocate each other! I know it doesn't happen all the time but it still does... And with two, I think, I can't be too careful. But we will put them close together, so they can "communicate" when they are a few moths old. Good idea to use a dresser with a mat on top because you can use the dresser afterwards. That is exactly what we did. The cot was second hand (mine when I was a baby) but bought a new mattress and the pram was also second hand (my second brothers) Are any of your family and friend getting rid of anything that their babies have grown out of? No, unfortunately not. There aren't that many babies in our family... :) I asked my friends around but nobody gets rid of any dresses at this point, unfortunately. You are so talented when it comes to decorating. I can't wait to see what you come up with. On "The Frugal Girl" blog she explains in a lot of detail how to paint furniture. You might buy odd used pieces and then paint them all white. Hmmm.. good question. I spent around $200.00 on the girls dresser from Wal-Mart. They share and it works great! I'm not sure how much i'd spend on one... i'd probably have heart palpatations spending what some new dressers go for now! lol!!! I would spend $300 on a new dresser but I would expect solid wood for that price. I'm not crafty so the thought of repurposing furniture is daunting to me. Keep on looking. You will find what you want. Now all that is left is for you to find what you want!